WooHoo! I am so excited to be participating in my first Papertrey Ink Blog Hop!! The theme for this month is spring. Put a little spring in your step by using anything that reminds you of spring in a project. Perfect for today since it really felt like spring outside! I decided to make a little clear treat box. I saw the tutorial HERE at Splitcoast Stampers. I used some older Imaginense papers I had in my stash. I pulled out my Around and About Sentiment stamps from PTI. For the matching card I used the Limitless Labels set, which i'm discovering is NOT just for wrapping nuggets!! Okay, scoring the acetate was NOT easy. I messed up totally once and then had a really hard time getting the folds to really be where I wanted them to be. Definitely a learning process! I topped the box with a cream ribbon and filled the box with jelly beans, perfect for spring!! The card is about 4'x2.5' and I love that label stamp right in the middle. So perfect with the flowers! Thanks for stopping by my blog today!! I cannot wait to visit everybody's blog and get a dose of Spring Inspiration!! Online Crop and a Sneak Peak!! We are having a Dr. Seuss online crop over at Color Me Daisy!!! Mark your calendar for March 6th, 7th and 8th. We are going to have some really fun games and challenges all dealing with Dr. Seuss. You can be sure there will be some funky, fun challenges and great games to play. And did I mention PRIZES??? We have a fantastic grand prize donated by a great new manufacturer you won't want to miss. So come on over to the message board, get registered, and get ready for some cropping fun!!! And here is a sneaky peak from the March kit over at Scrap N Supply Shack. This kit will have you wishing for spring for sure!! 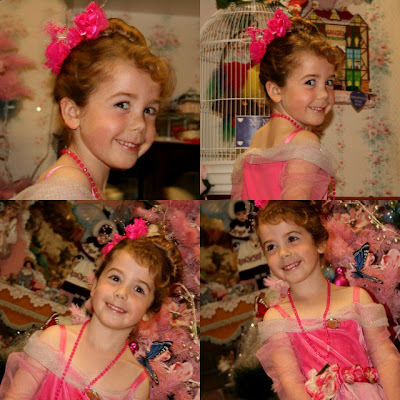 Kayla and I went to a birthday party two weeks ago at Olivia's Dollhouse. The girls had a huge room full of hundreds of dresses, shoes, handbags, scarfs, and anything else you need for dress up. The girls then had their hair, nails and makeup done. A fashion show followed and then a girly tea party. Oh my gosh, Kayla was in HEAVEN!!! In fact, most of the girls looked like they could probably move in and be very very happy!! So much fun watching them strut around like princesses. They had to pick a Princess name for themselves. So here she is...introducing...Princess Butterfly!! I made this photo collage in Picassa. I haven't used Picassa in a while and had fun playing a bit with it this morning. We had softball practice and playdates this morning and now we're just kicking back at home. I received my Moments 2 Remember March kit today and hope to get scrappy with it tonight! Hope you're having a great Saturday! This is my first time making a card for the card sketch blog, 2 Sketches 4 You. I am a blog follower, but this week I decided to make something! I was in the mood for something bright so I picked this orange cardstock to start. I'm not super happy with the end result, but it's done. And I do like the butterfly, LOL!! Thanks for stopping by! I'm thrilled tomorrow is Friday and i'm meeting up with girlfriends for some scrapping!! Yeah! And my daughter is feeling better, so double yeah!! I finished my card last night for the CPS sketch. I've been wanting to use this strawberry image on my latest Indie Art Cricut cartridge for a while and this was the perfect sketch!!! I came home early from work today to stay with my poor sick daughter. Coughing and runny nose and the poor thing is going through kleenex like it's going out of style!! Just follow the kleenex trail to find out where she is!! Hope you're having a good Wednesday! So it appears that my mojo is missing. Every layout i've tried to complete lately has just been a complete diaster. So I decided to stop doing layouts and try a couple of cards. I was following the February release party at Papertrey Inks and their design team just does amazing things with stamps and cards. I also like the Hero Arts blog, which always has fun ideas and amazing examples. So I thought i'd share some cards from this week. Here's my first one. Used some Basic Grey scraps and a Thank You stamp from Hero Arts. I also used my Scorpal to add the score lines to the middle white paper, don't know if you can see it or not! I learned about scraplings from the Hero Arts blog. 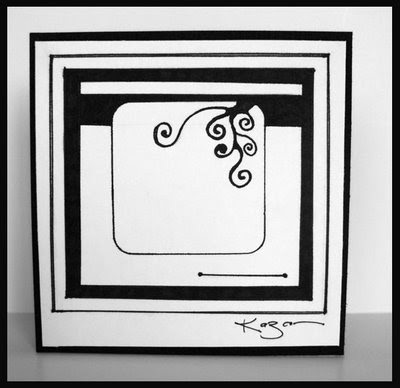 These cards are about 5 1/2 x 3 inches and stand tall. A fun way to use up patterned paper scraps!! A small square card that I was trying to do something else with...and this is what I ended up with! Does that ever happen to you??? LOL! Can you tell i've been going through my Basic Grey scraps????? I'm going to use the sketches this week from Card Positioning System and 2 Sketches 4 You and hopefully make some more cards tonight. Going to see if I can find my mojo again. Hope you're having a great Tuesday! I got busy in the kitchen last night making Red Valentine Cake Bites. The recipe as I first saw it is HERE...on Bakerella's blog. She makes awesome Cake Pops but last night I wasn't ready to deal with putting these little cuties on sticks. So they are just cake bites. I couldn't find red velvet cake mix OR did I have all the ingredients to make it from scratch last night. So I just took a box of yellow cake mix and added tons of red food coloring. I took them to work today and everybody who tried them agreed they are DA BOMB!!! My daughter told me I'm the BEST COOK in the WHOLE WORLD. And yes, she screamed it like that. You gotta love that! The lighting isn't perfect because it's been raining all day and I had to take my photos inside. But they are delicious to eat!! I even did a hard run this morning to hopefully compensate for these little cuties but I think I've already overshot my calorie burn today!! I better hurry...gotta finish up this one!! I frequently check out the Card Positioning System blog, and finally had time this week to use the sketch. Very simple and purple! I was in a purple mood last night. I'm trying to get my groove back when it comes to cards. I tend to overthink the whole thing and want to do too much. And that's when things usually go south. When will I realize that simple is better for me?? I love seeing all the cards with all the fanciness going on, they are gorgeous. But they just don't seem to work for me. So for now...simple it is!! Thanks for stopping by! I've been hard at work making lots of goodies for Valentine's Day. I am planning on making red velvet truffles tomorrow and Thursday to give to friends on Friday. I made Bakerella's Cake Pops for Halloween last year and they were a big hit. So...i'm doing her truffles! In the meantime, i've been using my Color Me Daisy February kit and making some fun goodie bags and goodie holders. Check it out! This is a bag in a box, super easy to construct. If you want the directions, you can find them here. This one is for my son's teacher, just going to fill it with some fun chocolate goodies. Here's a little Ghiradelli chocolate box. I found the tutorial at Splitcoast Stampers. I love that site! I could get lost all day in the gallery and tutorials. Here's a SUPER easy treat bag. I cut a scalloped circle 5 1/2 inches in diameter out with my Cricut. Folded it into a cone, secured with glue dots...and it's a treat cone!! Fill it up with anything you want, make a cute tag and you've got a super easy sweet little fun filled goodie cone!! Yes, that's the official name. I got the idea from this blog. I have to thank my good scrappy friend Beth for showing me this blog. It's filled with wonderful ideas and how-to videos. LOVE it! Thanks Beth!! And lastly I have 2 tin mailboxes that I found in the dollar spot at Target. Covered them with some American Craft paper and personalized them with my kids names. These will be for them on Valentine's Day. I also have some chocolate nuggets that I handstamped heart labels on. Those will be in the mailboxes along with some sweet valentine's from mom and dad. And maybe something else, haven't decided yet!! Thanks for stopping by! I hope you're having fun making Valentine goodies for you loved ones. 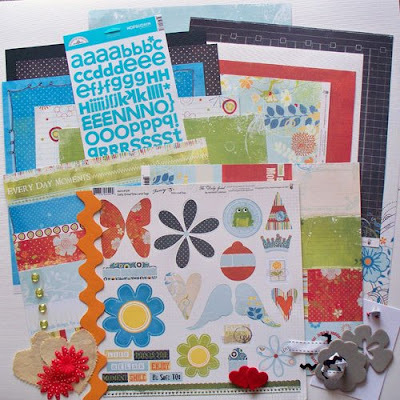 The February kit from Moments 2 Remember is full of great papers from the It's A Grind line by Fancy Pants! Check this out, all this for only $20! What a deal! Such fun, bright colors to work with. Perfect if you are craving a little bit of spring or summer right now! Here's what I did with this great kit. I had plenty of paper left over for a few cards as well! Lots of fun challenges every month on the message board. Earn enough points to earn your monthly charm at Moments 2 Remember. Join us for the fun all month long!! Papertrey Inks and Nichole Heady have another challenge, this time a card challenge. And a chance to win their new polka dot ribbon!! I had to download a pdf file and then do a connect-the-dot to reveal a card sketch. And here's my card using that sketch! I have a stamp set called Dress Up Lily from Pink Cat Designs that I bought to make my daughter's birthday invitations last year and I haven't used since. I need a few cute girly princess-type birthday cards for this weekend so I decided to dig out the stamp set and use it again. I'm not very good at these big image stamps and I don't do this style very often. But I had a ball playing and coloring these stamps! So much fun, I made two more cards. Very similar in design and pretty simple but when my daughter saw them this morning she was giddy with excitement! I think she actually squealed. She loved them and can't wait to fill out the inside of the cards for her girlfriends! Seriously, how did I end up with such a girly daughter?? Thanks for stopping by! Papertrey Inks is celebrating their 2 year anniversary and I couldn't be more excited! I just recently discovered their stamps through a few of their design team members blogs and I LOVE them!! Dawn Mcvey is an amazing artist and design team member, I just love her projects and her blog. Call me a stalker, but I visit her blog at least once a day. I want to make cards like her when I grow up! 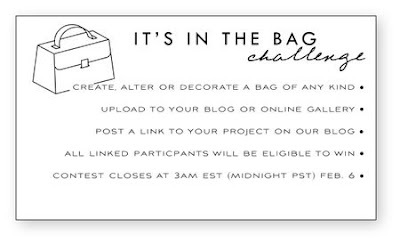 They are doing really fun challenges and giveaways every day until February 15th and today it was Make-a-Bag. So, here's my bag!! My daughter has already claimed it for herself. She's going to fill it with treats for her teacher on Valentine's Day. I used my new stamp set called Around & About Sentiments. I love it, so versatile. I just started playing with it and i'm sure I haven't even scratched the surface of what I can do with it. The light isn't great, it's been rainy and dark all day today. But you get the idea!! Thanks for stopping by! Color Me Daisy "Sweet Romance"
February's kit from Color Me Daisy is SOO sweet...Bittersweet that is!! It has loads of goodies from the Basic Grey Bittersweet line. It also has paper from American Crafts 'Romance' line. Just look at all this goodness!! 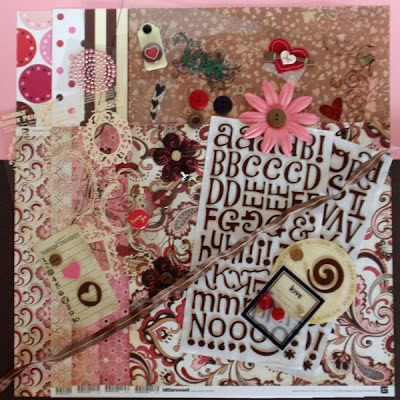 I had a blast playing with this kit, such beautiful colors that are not just for Valentine's or love layouts. For this project, I used the cardboard insert that came in some packaging (probably left over from the holidays!! ), tore it up a bit, added a layer of pink acrylic paint and then added photos, papers and embellies. This is proudly displayed in my office at work! Those are some of my favorite pics of my kids right now. And some cards! I love this 4x4 size!! 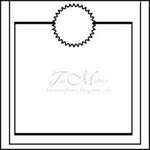 I cut the scalloped squares with my cricut, then added a score line so I could put the two together to make a card. This kit was great fun with beautiful colors. Don't forget to check out the CMD message board. We just added 2 new Daisy Girls and have lots of new challenges up for February!! Thanks for stopping by!